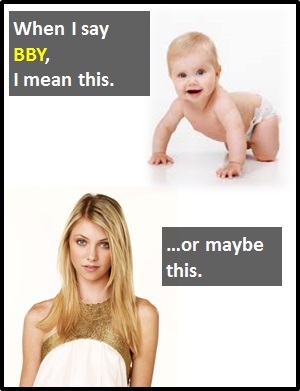 The abbreviation BBY is typically used with the meaning "Baby", as a term of endearment between couples. Among school children, BBY can be used by bullies to ridicule or humiliate other children. Of note, together with the words "Home, "Money" and "Love", "Baby" is one of the words most often repeated in song lyrics throughout the past 50 years. BBY (baby) can be used literally or figuratively. Maria: You're looking fat these days. Alison: So would you if you were having a BBY. Carla: I love you too, BBY. BBY is a contraction of "Baby". Some contractions, like AMP (Amplifier), use the opening letters of the fully expanded version. Other contractions, like Dr (Doctor), use letters from the start and end of the fully expanded version. Contractions can also be formed by replacing a letter(s) with an apostrophe (e.g., can't). Before the digital era, we might have just said "Baby" or something like "Sweetheart" instead of using BBY as a term of endearment.